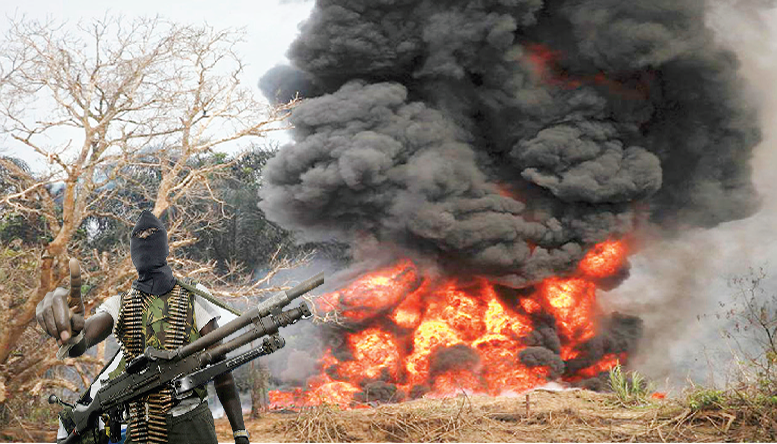 Militants belonging to the Niger Delta Greenland Justice Mandate (NDGJM) have claimed responsibility for the blown up Nigerian Petroleum Development Company (NPDC) major trunkline/delivery line in Udu local government area of Delta state. In a statement signed by its spokesperson, Aldo Agbalaja, the group warned the NPDC not to effect any repair on the blasted facilities until the oil company heard from it, This Day reports. The NDGJM demanded that the federal government should call an urgent and all-encompassing meeting of genuine stakeholders of core Niger Delta communities, especially those from oil producing communities to create a truly Niger Delta platform, where real issues of injustice and what correcting them should look like. The group added that The oil multinationals must be part of the meeting while the United Nations would serve as witness to this alongside some very credible international NGOs. According to the group it was not comfortable with the insinuation that the whole of Niger Delta was involved in the ongoing negotiations between the federal government, oil companies and the Ijaw elements in region. It also demanded that the military stop harassing its people and communities in the region, saying it was aware of “plots by the federal government to attack communities in the creek in the name of wiping out militancy. The NPDC delivery line was blown up at about 2am on Friday, August 19, though security sources disclosed that the said gas trunk line has not been in use for a long time now and the militants just breached it to claim unnecessary attention. It was attacked a few hours after the General Officer Commanding (GOC) 2nd Division of the Nigerian Army, Ibadan, Major-General Kasimu Abdulkarim visited Asaba, the Delta state capital.